See further down page for the latest images from God's Little Acre. I served with the Royal Navy on HMS CENTAUR during the Indonesian Confrontation, and was awarded the 1962 General Service Medal, Clasp Malay Peninsular. I am now retired and living in Queensland Australia. 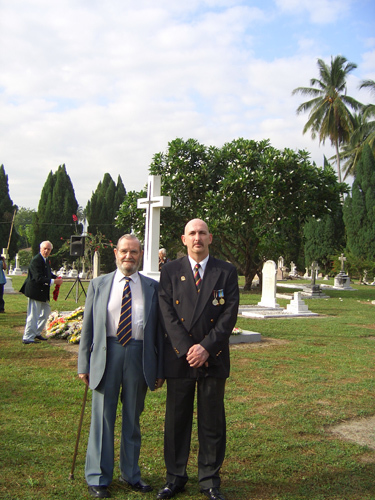 I am a member of the Malaya Borneo Veterans Association that has branches in a number of Commonwealth countries, Australia & New Zealand among them, as well as the United Kingdom. I would like to bring to your attention the dedication and commitment of many of those veterans on behalf of their comrades who never returned to their homelands and now lie buried in Malaysia. 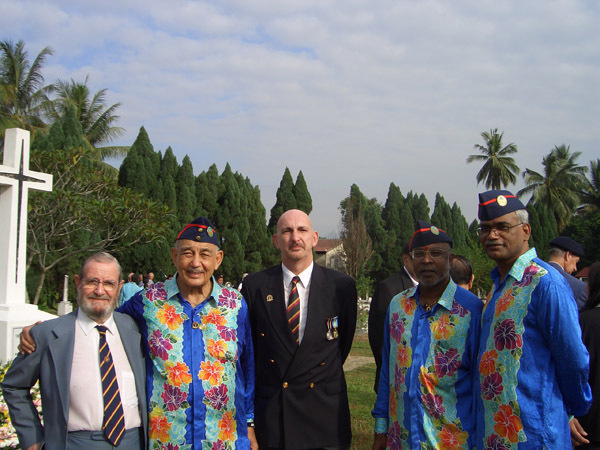 Each year around June, veterans from UK and Commonwealth countries have gathered for more years than I care to remember at Batu Gajah, Perak, Malaysia. 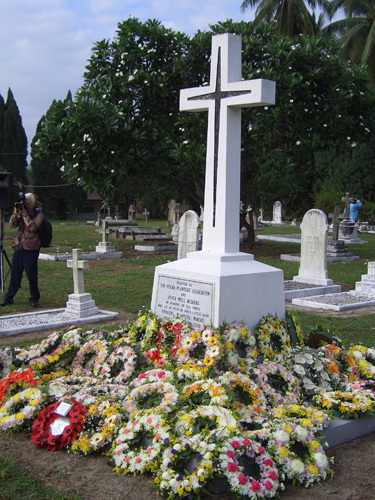 At Batu Gajah, a small town in the State of Perak, some 15 miles north of Ipoh lies “Gods Little Acre” a most beautiful Cemetery where lie over 160 graves of those British and Commonwealth Servicemen who died during the Malayan Emergency 1948-1960. The names and Regiments of those that lie buried reads as an everlasting memorial to those who made the ultimate sacrifice. Many of those killed were barely more than 20 years of age. Famous Regiments, such as The Kings Own Yorkshire Light Infantry, Coldstream Guards and Green Howards all lie here beside Royal Marines, British Police Officers, and Iban trackers who served with the British Army. 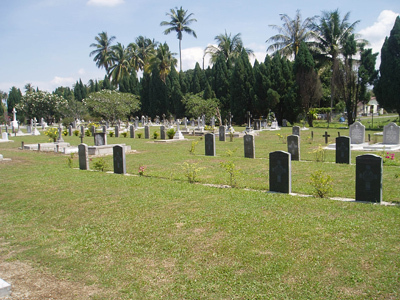 Batu Gajah was not always the serene and beautiful place it is today, for this is not a Cemetery run by the Commonwealth War Graves Commission. Some thirty years ago a Malaysian Police Officer stumbled upon an abandoned and vandalised Cemetery during his Police work. He found the neglected resting place of these British & Commonwealth Servicemen. Thambipillay Rajasingam was that Police Officer. He was saddened by the state of the Cemetery and decided to do something about it. He organised its restoration. Many Malaysians became involved and gave their time and resources. Batu Gajah stands as a testament to their efforts. Thambipillay Rajasingam, then Batu Gajah’s Police Chief, organised the first Remembrance Day in 1980. 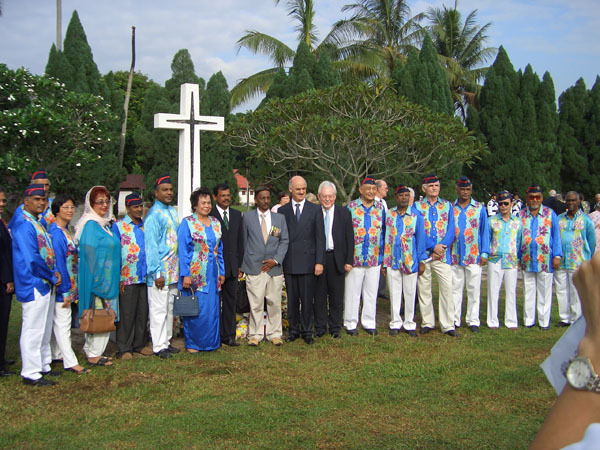 Since then, with the restoration work on-going, it has become an Annual Remembrance Day attended by Malaysian Officials such as the Mentri Besar of Perak (Chief Minister), the Ketua Bandor (Lord Mayor) of Ipoh (State Capital), High Commissioners from Commonwealth countries, and Defence Attaches. 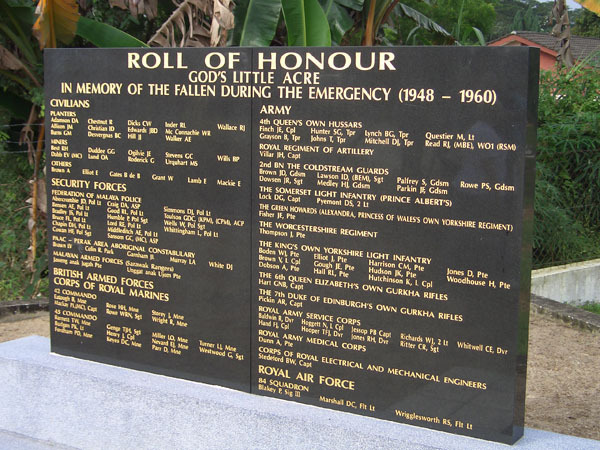 Over the years hundreds of Malaya Borneo Veterans from Britain and the Commonwealth have come to pay their respects to their fallen comrades. 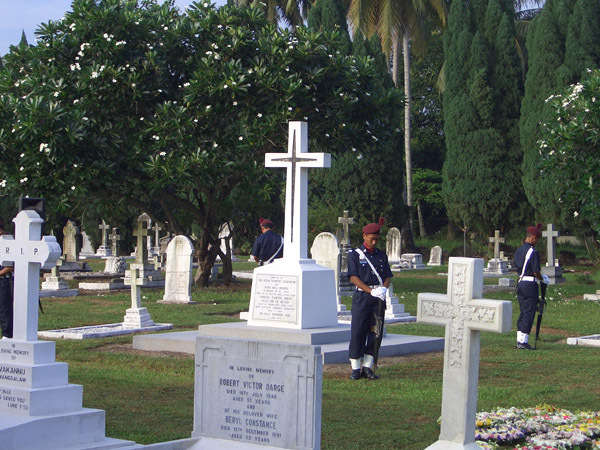 Thambilpillay Rajasingam, long retired from the Police, is still active today in maintaining the Cemetery. He was recently honoured by Australia for his work and made an Honorary Member of the Order of Australia. This was presented recently by the Australian High Commissioner in Kuala Lumpur, his Excellency James Wise. 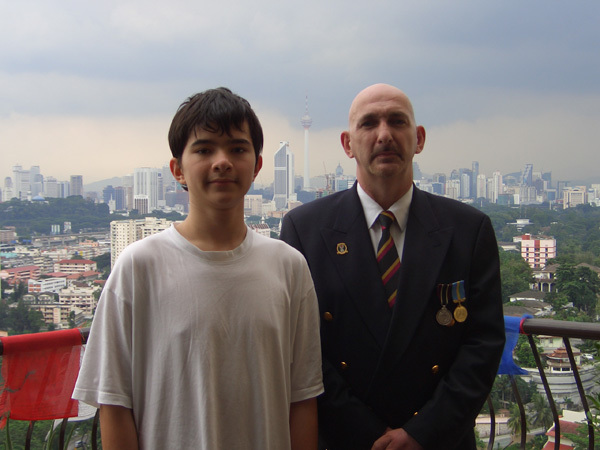 What saddens me, and many ex UK Servicemen living in Australia, is the message that Britain seems to be sending to the Malaysians regarding its doubts about awarding British Servicemen the Pingat Jasa Malaysia (PJM). Both Australia and New Zealand have accepted the Malaysian Governments kind offer to award their servicemen the PJM in recognition of their service during Malaysian conflicts. Batu Gajah is a wonderful example of genuine friendship, and an obligation to British War Dead. The dedication of these Malaysians is, to say the least, confused and somewhat hurt by Britain¹s seeming refusal to accept and recognise the Pingat Jasa Malaysia (PJM). They remember our War Dead. Should we not in turn respect their wish to recognise our Servicemen? Lest we all forget what it¹s all about. Royal Navy Retired. M984530 CPO. We are very pleased to be able to publish these images from the moving ceremony at God's Little Acre in June this year. “Just back from Batu Gajah. Had a wonderful day. 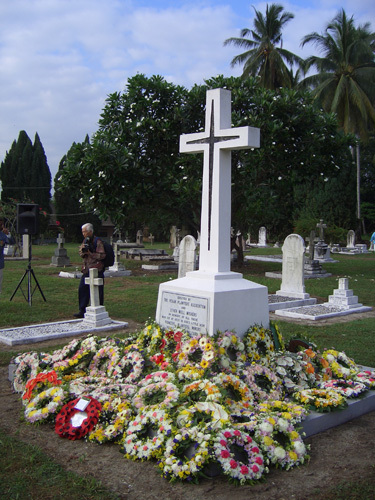 Lawrence was there laying a wreath on behalf of the Ipoh Chinese civilians who died. Also met a few lads I hadn’t seen for a while. Went to the Church Service at 07.30 this morning and then walked down to the wreath laying ceremonies in the Cemetery, followed by coffee at the Kinta Golf and Country Club. The British Ambassador, Kiwi Ambassador and Aussie Ambassador were there with other Malaysian Government and Police dignitaries. I did manage to present a lapel badge to Mr. Harold Speldewinde (who is actually Malaysian), as he is the current President of the Malaysian Veterans Association. I understand he fought the Japanese in Malaysia and the CTs during the emergency and is quite a character. I was approached by a number of people afterwards who were over the moon with the presentation of the lapel badge, as apparently Harold had shown everybody and was absolutely delighted. I think that this is a great one for you guys. I have attached pictures of Cliff and I (Cliff came to Burma in 1944 as a Signaller, then to Singapore as a Police Inspector landing in Malaysia in 1948. He was an Auxiliary Police Inspector in Malaysia as well as being a planter and was shot on three separate occasions during the emergency), the cemetery, Harold being presented with his PJM lapel badge, and a few other photos I thought you might like. Hope these are ok. 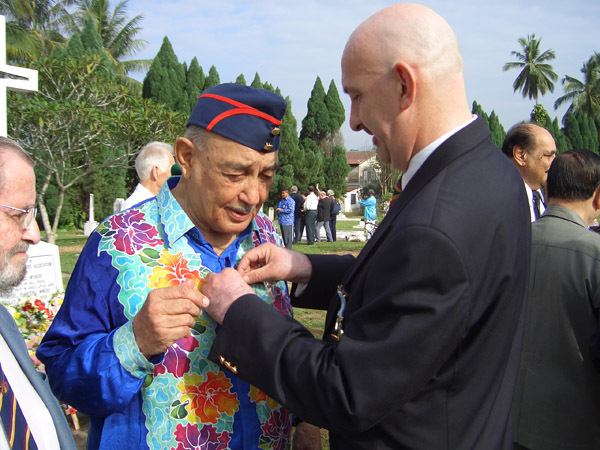 I can honestly say that your lapel badge was magnificently received and I seem to have become a bit of a celebrity - as one Malaysian Veteran said… “it’s the only field commission Harold ever got”…….! Here are Peter's images. I think you'l agree that they are very moving. Comment: I served with 11 Indep Fld Sqn RE 1955-58, 58-60. In that we lost five who will never return home. Most of this government were never born then. Would they like the men who were given French medals after the last war give them back? Comment: God's Little Acre was just a tiny little piece of dirt the first time I ever saw it. I am not sure but I think it was Oct,1948 or early 1950. My Pln, 4 Pln, 1 KOYLI was wiped out. At an abandond tin mine not far away called Bidor. I would like to thank all involved in its Restoration. F D Keenan.